11 Why do some people get depressed after a stroke but others do not? 12 How can you tell if someone is depressed after a stroke? 13 How are patients and the people close to them affected by depression? 14 What are the treatment options? 15 How can you help people with depression after a stroke? The Brain Recovery Clinic is part of the Centre for Brain Research which comprises over 200 researchers from both the University of Auckland as well as leading neurologists, neurosurgeons and physicians. Anyone who has had a stroke, or TIA, can attend the clinic for an assessment of their current condition. Referrals can come from your GP, health professional or a Stroke Foundation field officer. The referral form can be found at the bottom of this page. You can download it, or print it out. You will have a comprehensive evaluation to ensure that everything is being done to meet your recovery needs. Future appointments may be made with therapists at the Clinic, or to outside agencies where appropriate. You may also be given the option to take part in studies looking at new treatments or rehabilitation therapies as part of the Centre for Brain Research programmes. The assessment service is provided on a fee for service basis. The initial 90 minute assessment costs $180.00 including GST. A stroke happens when blood flow to a part of the brain stops. A stroke is sometimes called a "brain attack." If blood flow is stopped for longer than a few seconds, the brain cannot get blood and oxygen. Brain cells can die, causing permanent damage. Ischemic stroke occurs when a blood vessel that supplies blood to the brain is blocked by a blood clot. High blood pressure is the number one risk factor for strokes. Your age - Risk of stroke increases with age. Your gender - Men have a higher risk of getting heart disease than women except in older adults. Your genes or race - If your parents had a stroke, you are at higher risk. African-Americans, Mexican Americans, American Indians, Hawaiians, and some Asian Americans also have a higher risk for heart problems. Do not smoke. If you do smoke, quit. Control your cholesterol through diet, exercise, and medicines, if needed. Control high blood pressure through diet, exercise, and medicines, if needed. Control diabetes through diet, exercise, and medicines, if needed. Maintain a healthy weight by eating healthy foods, eating less, and joining a weight loss program, if needed. Limit how much alcohol you drink. This means 1 drink a day for women and 2 a day for men. Avoid cocaine and other illegal drugs. Talk to your doctor about the risk of birth control pills. Birth control pills can increase the chance of blood clots, which can lead to stroke. Clots are more likely in women who also smoke and who are older than 35. Good nutrition is important to your heart health and will help control some of your stroke risk factors. Choose a diet rich in fruits, vegetables, and whole grains. Choose lean proteins, such as chicken, fish, beans and legumes. Choose low-fat dairy products, such as trim milk and other low-fat items. Avoid sodium (salt) and fats found in fried foods, processed foods, and baked goods. Eat fewer animal products and foods that contain cheese, cream, or eggs. Read labels, and stay away from "saturated fat" and anything that contains "partially-hydrogenated" or "hydrogenated" fats. These products are usually loaded with unhealthy fats. Your doctor may suggest taking aspirin or another drug called clopidogrel (Plavix) to help prevent blood clots from forming. DO NOT take aspirin without talking to your doctor first. If you are taking these drugs or other blood thinners, you should take steps to prevent yourself from falling or tripping. Follow these guidelines and the advice of your doctor to lower your chances of stroke. F - Smile; Is one side drooping? A - Arms; Raise both arms - is one side weak? S - Speech; Speak - unable to? Words jumbled, slurred? T - Time; Act fast and call 111. Time lost may mean brain lost! Stroke is a medical emergency that needs to be treated right away. Call your local emergency number (111) if someone has symptoms of a stroke. The symptoms of stroke depend on what part of the brain is damaged. In some cases, a person may not know that he or she has had a stroke. Symptoms usually develop suddenly and without warning. Or, symptoms may occur on and off for the first day or two. Symptoms are usually most severe when the stroke first happens, but they may slowly get worse. A headache may occur, especially if the stroke is caused by bleeding in the brain. Other symptoms depend on how severe the stroke is and what part of the brain is affected. A complete exam should be done. Listen for an abnormal sound, called a "bruit," when using a stethoscope to listen to the carotid arteries in the neck. A bruit is caused by abnormal blood flow. Check your blood pressure, which may be high. Tests can help your doctor find the type, location, and cause of the stroke and rule out other disorders. An Angiogram of the head can show which blood vessel is blocked or bleeding. A stroke is a medical emergency. Immediate treatment can save lives and reduce disability. Call 111 or seek urgent medical care at the first signs of a stroke. It is very important for people who are having stroke symptoms to get to a hospital as quickly as possible. If the stroke is caused by a blood clot, a clot-busting drug may be given to dissolve the clot. Most of the time, patients must reach a hospital within 3 hours after symptoms begin. Some people may be able to receive these drugs for up to 4 - 5 hours after symptoms begin. Treatment depends on how severe the stroke was and what caused it. Most people who have a stroke need to stay in a hospital. Clot-busting drugs (thrombolytic therapy) may be used if the stroke is caused by a blood clot. This medicine breaks up blood clots and helps bring back blood flow to the damaged area. However, not everyone can get this type of medicine. For these drugs to work, a person must be seen and treatment must begin within 3 hours of when the symptoms first started. A CT scan must be done to see whether the stroke is from a clot or from bleeding. If the stroke is caused by bleeding instead of clotting, clot-busting drugs (thrombolytics) can cause more bleeding. Blood thinners such as heparin or warfarin (Coumadin) may be used to treat strokes due to blood clots. Aspirin or clopidogrel (Plavix) may also be used. Other medicine may be needed to control symptoms such as high blood pressure. In some situations, a special stroke team and skilled radiologists may be able to use angiography to highlight the clogged blood vessel and open it up. If bleeding occurred, surgery is often needed to remove blood from around the brain and to fix damaged blood vessels. Surgery on the carotid artery may be needed. Nutrients and fluids may be needed, especially if the person has trouble swallowing. These may be given through a vein (intravenously) or a feeding tube in the stomach (gastrostomy tube). Swallowing trouble may be temporary or permanent. Physical therapy, occupational therapy, speech therapy, and swallowing therapy will all begin in the hospital. The goal of treatment after a stroke is to help the patient recover as much function as possible and prevent future strokes. The recovery time and need for long-term treatment is different for each person. Problems moving, thinking, and talking often improve in the weeks to months after a stroke. A number of people who have had a stroke will keep improving in the months or years after the stroke. You may recover completely, or have some permanent loss of function. Over half of people who have a stroke are able to function and live at home. Other people are not able to care for themselves. The risk for a second stroke is highest during the weeks or months after the first stroke. Then the risk begins to decrease. Grief and sadness are normal after a stroke. Depending on how severe the stroke is, it can have an enormous impact on a person's life. People who used to lead independent lives before their stroke, and now rely on outside help, will have a lot of adjusting to do – both psychologically and in the practical aspects of their day-to-day life. Therapy can help people regain more independence, and most people and their families will gradually adjust to the changes in their lives. But some people will become depressed, and ongoing depression could have an impact on many aspects of their lives. The depression may not be diagnosed, though, or people may think it is normal and take no action to treat the depression. It is not always easy to know if a person who has had a stroke is suffering from normal sadness or depression. It is important for people who have had strokes and their families to get the support they need to avoid depression or to get help if depression does set in over weeks or even months. Why do some people get depressed after a stroke but others do not? It is hard to know for certain how many people get clinically depressed after a stroke. It is estimated that about one third of all people who have had a stroke will develop a depression. This is sometimes called post-stroke depression (PSD). Women may have a slightly higher risk of becoming depressed following a stroke. Researchers are not sure whether the cause of post-stroke depression is more physical or psychological in nature. When people have a stroke, a part of the brain becomes damaged because the blood supply is cut off for some time and so not enough oxygen reaches it. Some argue that the physical changes that happen in a person's brain when they have a stroke affect their emotions. Others believe that people become depressed because they feel frustrated and sad about the physical and mental disabilities they have after a stroke. This is often called reactive depression. In the first few weeks after a stroke, people have to come to terms with having experienced this life-threatening situation and have to recover physically. In the mid to long term, coping with disabilities and the related effects on their personal and social lives might be too hard for some people to manage. People who have a major stroke and people who have experienced depression before their stroke are more likely to become depressed than those who have a mild one. The severity of a person's depression often depends on how much he or she is physically and mentally restricted in daily life. Studies have shown that a person's social environment, living arrangements and the support they get can also influence the likelihood of developing post-stroke depression. If the person with the stroke and their caregiver receive good information and support, it might help reduce the chances that they will become depressed. A number of other possible influences have not yet been researched properly. For example, it is not clear how much factors like difficulties speaking and understanding (aphasia), signs of confusion or dementia influence the development of depression. Sometimes post-stroke depression goes away on its own after a while without being treated. Most people who have had a stroke and have been depressed for months, however, will need to get help to overcome this illness. How can you tell if someone is depressed after a stroke? It is important to remember that there is a difference between being depressed and feeling down after a stroke. Although as with any crisis in life there may be unexpected positive changes after a stroke, there can obviously be many reasons to be unhappy. Strokes often lead to paralysis on one side of the body. That can seriously affect a person's ability to move or lead an independent life. Everyday activities like eating and washing may become difficult without the help of others. On top of this, a person may have little or no feeling in the paralysed side of their body. Problems with speech or understanding could be a further burden. Not being able to communicate properly can be very depressing. Some people may not feel depressed but they are unable to express their emotions as easily as they could before their stroke so they may appear depressed. So, depression after stroke can be tricky to detect. Depression after stroke is diagnosed on the basis of the same symptoms as depression at other times. If several of these symptoms occur together and last for more than two weeks, it could be a sign of depression. It is important to speak with the doctor if you suspect it may be depression, so that she or he can find out whether the symptoms are normal or a sign of illness. If the depression is recent, there will probably be another assessment in a few weeks to see if there has been any change in mood. If the person is starting to drink more alcohol, for example, it could also be a sign that they are having real trouble coping psychologically. Sometimes people who are depressed are over-emotional. They might have less control over their emotions after a stroke, and find that they suddenly start crying – or laughing – in inappropriate situations. Or they might generally be more volatile and less stable. How are patients and the people close to them affected by depression? Being depressed can slow down recovery after a stroke. Whether or not stroke-related disabilities improve depends on a number of factors, including how actively a person participates in their therapy. For example, certain physical exercises can help to improve movement on the paralysed side of the body. It often takes a long time to recover from a stroke, as well as a lot of patience and motivation. People who are depressed find it more difficult to motivate themselves and may not be able to work as hard to restore their health as people who are not depressed. As a result, it could take them longer to recover, or their physical and mental abilities may even get worse. The person who is looking after the one who had the stroke can also become depressed. If the caregiver is depressed, it could make it harder for the person who has had the stroke to cope with their own feelings. Obviously, if the caregiver is depressed they might also find it harder to support the person affected by the stroke as much as they would like to be able to. So looking after the caregiver is not only important for them and other family members, it is important for the person who has had the stroke as well. Giving caregivers enough support is part of providing good care to someone who has had a stroke. Looking after a family member who has had a stroke can be a very rewarding and life-enriching experience. But it can also be extremely challenging and stressful, at least at times, and people may feel more helpless or aggressive than anything else. Depression is often treated with medication (antidepressants) and/or psychological interventions, like counselling or psychological ("talking") therapies. The treatment options include support, learning about your patterns of thinking and training to deal with stress, or to learn how to relax. Some people also use complementary therapies, like massage or herbal products with ingredients like hypericum (St John's wort). Researchers from the Cochrane Collaboration looked for trials on how well these treatments work in post-stroke depression. There have not been many trials that have tested depression treatments specifically in people who are depressed after a stroke. Only antidepressants and psychological treatments have been tested, and none of these have been studied enough to be able to tell what is the best treatment to try. You can read more about that research here. The researchers concluded that although some antidepressants might be able to help people who are depressed after a stroke, they might not work in the same way as they do in "normal" depression. There has not been enough research on using antidepressants in PSD, for example with people who have difficulties with speech or understanding. They can have adverse effects such as drowsiness and gastrointestinal problems. Antidepressant drugs may also cause particular problems after a stroke. However, antidepressants could help people who are depressed after a stroke and also become very emotional and experience big mood swings. More research is needed to find out if this is true, though. Antidepressants affect the brain. They might increase the risk of falls and seizures in people who have had strokes, for example. So more research has to be done to make sure that the medication does not increase people's risk of negative effects like these. Antidepressants could also influence the effects of other drugs ("drug-drug interactions"). For these and other reasons, doctors will want to monitor a person with a stroke on antidepressants very carefully, because it might be necessary to stop or change medications. However, medication is not the only option. Unfortunately, there is still not enough research to be sure about what psychological options could be helpful. The Cochrane researchers did not find trials of particular psychological interventions that were definitely very helpful in the treatment of post-stroke depression. Other Cochrane researchers looked for trials on the effect of providing good information and support to people with strokes and their carers. They found that this might help relieve depression, although the benefit is not enough to really reduce the symptoms of a major depression. A number of factors other than medical and psychological therapy play an important role in the prevention and treatment of depression too. Everyday support through relatives or nurses can have an important influence on recovery after stroke, or play an important role in coping with disabilities. The more support they receive, the more successful their rehabilitation after a stroke is likely to be. In turn, a good physical recovery can have a positive effect on mental health. How can you help people with depression after a stroke? People recover better from a stroke if they receive good support and therapy. Research has shown that people cope more successfully in the long term if treatment is very well organised, and nurses, doctors, occupational therapists, physiotherapists and people close to them actively participate in their care. Occupational therapy in particular can help to regain certain body functions. This involves working on daily activities like washing, getting dressed and doing things around the house. Successful rehabilitation therapy needs a lot of motivation, but it can make an important difference to people's lives after a stroke. You can read more about occupational therapy and physiotherapy after a stroke here. Simple words of encouragement and advice usually do not help to motivate people who are depressed. A lot of patience and understanding is needed to handle the illness, particularly because it is often associated with strong mood swings. Depression is different in different people. For example, older people tend to experience physical pain as part of their depression more often than younger people. Post-stroke depression could be unique in certain ways too. Although many support options have not been properly studied yet, there are several strategies which may be helpful for the family and friends of a depressed person. You can find more information about this here. There are a number of self-help groups and support centres that provide people who have depression and those close to them with advice about various health care, financial or psychosocial matters. 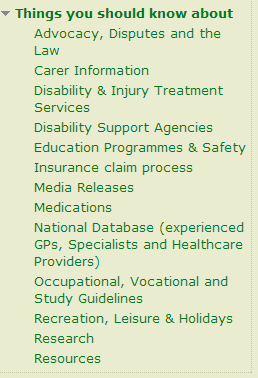 For example, many cities and local authorities offer special information services on nursing care, free of charge. Close friends and family members can also attend courses to learn basic nursing techniques, among other things. Looking after a family member who has had a stroke can be a major challenge, but there is a lot of help available.